I almost forgot to take a shot of tonight’s dinner – luckily I remembered before it was completely devoured. 1. Saute onions in a frying pan until soft, add chives, ham and garlic, stir and put aside. 3. 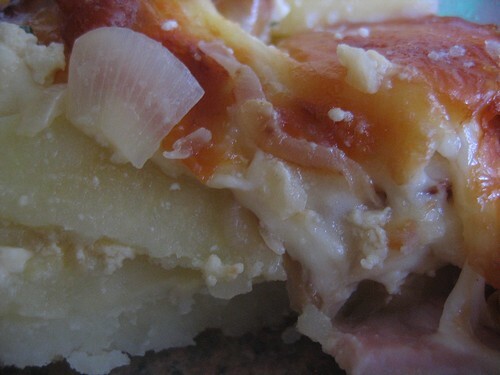 In a oven proof dish, layer 1/3 of the potatoes, 1/3 of the onion mix and 1/3 of the egg mix. Repeat until you have three layers of each. 4. Pour water over the mix until the level of liquid meets the top potato layer. 5. Sprinkle cheese over, cover with foil and bake for 40 minutes. 6. Uncover and continue baking until the cheese is brown. That is my absolute favourite way to eat potatoes…. its making me hungry even though I’ve already eaten dinner.